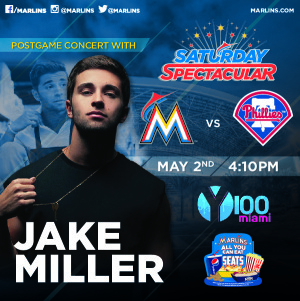 The Saturday Spectacular summer concert series at Marlins Park is back! Throughout May, June and July this season, fans can visit the West Plaza after five Saturday afternoon games for a FREE post-game performance. The best part? All You Can Eat Seats are available for every Saturday game, starting at just $35 — so you can thoroughly feed both your appetite and your musical tastes. 5 – Jake Miller – The 21-year-old YouTube sensation — a South Florida native — will have his teen army of “Millertary” screaming with his latest hit “Dazed and Confused”! Saturday, May 2nd vs. Phillies — game at 4:10 PM. Free concert right after! 4 – Charli XCX – She’s in the fast lane from LA to Tokyo, and now she’s coming to Marlins Park! Get ready to “Boom Clap” when this British pop singer takes the stage.